Posted on November 8, 2013 This might be outdated! This is fantastic! Do you know if there is a way to add a coupon code to an order through the dashboard admin area (for example, creating manual orders)? I’ve found this link (http://stackoverflow.com/questions/19551694/woocommerce-need-hook-when-admin-manually-creates-order), but is there a way to hook this in with a custom field maybe? I’ll keep muddling through, but I thought it might pique your interest. We are in need of the same thing on the PDF printable invoice ?? It doesn’t show the coupon code, just the dollar off amount ? Any way to show the coupon code on the “PDF Invoice” that we print ?? Hello Remi, can you elaborate further on this please? Do you mean adding something like this in PDF Invoice Template’s Template.php? is there a way to display the specific name of the used coupon in order details and customer emails? Hmmmm… isn’t it what the code does? haven’t expressed myself clearly. I mean the part of the order table disyplayed in customer emails under the row “subtotal”. This is fantastic work Remi – Should be core! Hi Remi, I’m Tim. Just found your site and I love it, but I still can’t find what I need and maybe you can assist. We did a groupon type deal, issued 1k coupon codes and sold 400. Problem is, I don’t want to scroll through 60 pages of coupons to try to find the ones that are used. Is there a way to sort the coupons? Say, click the “usage / limit” head and it will sort? This way, I can go to the first pages and see the 331/*, the 1/1 coupons then eventually come to the 0/1 coupons. Or even sort the coupons by used / not used? I like sorting things and this would make life simple! I’m new to your site and somewhat of a newb to WooCommerce and WordPress. I have added your “show username” snippet to the functions.php and it worked perfectly………when I try to add this code to the bottom of my functions.php, the code shows up above the header on my site(AggielandVIP.com). Would there be a specific location on the functions.php where I should put this? I’ll order a $5 item if you can help me get this implemented as it would be a great addition to my site! Thanks in advance for any help you can provide keep up the great work! Thank you and great post! Is it possible to add a coupon code to the Order edit Page? At times the site admin need to complete an order which is placed telephonically, for someone that already has a customer account. It is just so much simpler to do it from the backend. This doesn’t appear to work with WooCommerce 2.6+. After I add this to my theme’s custom functions PHP file I don’t see an errors but nothing new appears in the “new order” admin emails. Any chance you can update the code, Remi? Hi, is there anyway to ad script to the code to populate a custom field against the order so when we export the order record with the coupon cold also? I have activated WooCommerce in my site for the first time, & i have a question. 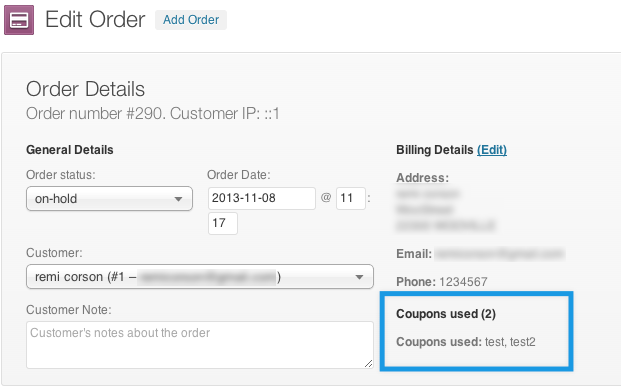 I want to display Applied Coupon Code in Email Template Which is sending to Admin on Every New Order Placement. Let me know which file or which code i need to apply for this situation. Main query is i have to do this using another plugin, so can you tell me how to access New Order Email template in another plugin and add applied coupon code in email template then send mail.